Kesha’s latest album 'Rainbow', called "an artistic feat" by Entertainment Weekly and "the best music of her career" by Rolling Stone, marks a new beginning for Kesha. Based around inner strength and musical exploration, her latest No. 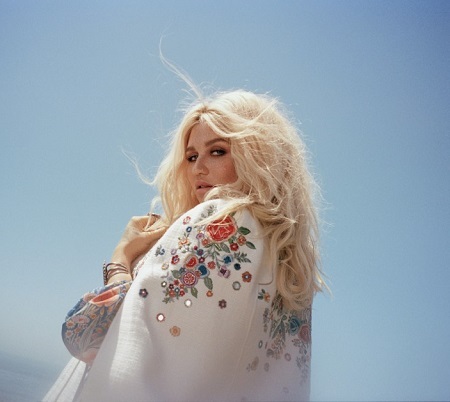 1 album finds Kesha at "her defiant, unbridled best" (USA Today), boasting collaborators ranging from Ben Folds to Eagles of Death Metal to Dolly Parton. The album has garnered praise from the New York Times, Billboard, NPR Music and more, and earned Kesha her first-ever GRAMMY nominations at the 60th Annual GRAMMY Awards for "Best Pop Vocal Album" and "Best Pop Solo Perormance" for "Praying". Billboard describes lead single "Praying" as a "ballad that tears at your soul" while Consequence of Sound says "no other song in recent memory so perfectly embodies the way in which hope itself is a kind of triumph." Other reviewers have highlighted songs including "Hymn," a "powerful outsider anthem" (Rolling Stone); the "feminist battle cry" (Mic) of "Woman"; "Hunt You Down," which PopCrush describes as "far more authentic than anything currently playing on country radio"; and "Learn to Let Go," "the most carefree, uplifting song we've heard from her" (Jezebel). When Kesha released her debut album, 'Animal' in 2010, Billboard declared her its Hot 100 Artist and her debut single, "TiK ToK," the #1 Hot 100 Song. It was also the most played song and the world's top-selling track that year. 'Animal' has sold more than 8 million album equivalents worldwide, and Kesha has sold more than 13 million total album equivalents worldwide. Kesha has had 9 Top 10 hits on The Billboard Hot 100, including four #1 singles at Top 40 Radio - "TiK ToK," "Your Love Is My Drug," "Die Young," and "Timber." Kesha took home the MTV EMA for Best New Act in November 2010 and was nominated for 2 American Music Awards, 3 MTV VMA Awards, and 6 Billboard Awards. She has performed on dozens of television programs all over the world, including MTV Europe Music Awards, Much Music Awards (Canada), Echo Awards (Germany), X Factor (Australia), American Music Awards, Billboard Awards, American Idol, Saturday Night Live, and The Today Show Summer Concert Series. She has over 28 million Facebook followers, over 2 million Instagram followers, 3.74 million followers on Twitter, and over 1 billion views on VEVO. She has sold over 41 million tracks and streams in the U.S alone and over 87 million tracks and streams worldwide to date. 'Animal' has been certified Gold, Platinum or multi-Platinum in over 15 markets worldwide (including Platinum in the United States) and was the biggest-selling debut album from an international female in 2010 in the UK. Kesha executive produced two seasons of the television show "Kesha: My Crazy Beautiful Life" for MTV, as well as wrote a book of the same name that gave a look into the creative process of her latest album, 'Warrior'. As a songwriter she has penned her own music as well as songs for artists including Britney Spears, Ariana Grande, The Veronicas, and Miley Cyrus. She is an animal rights crusader as the Humane Society International's first Global Ambassador and a passionate advocate for equality, being honored with the 2016 Human Rights Campaign Visibility Award. In 2016 she won Billboard's Women in Music Trailblazer Award.